Refurbished DeVere Universal Timer as specified for use with the 203, 504, 507, 5108, 515 and other models of DeVere enlargers. The Universal Timer has the special connector that plugs into the multi pin socket on the enlarger's power supply, so it works equally well with 240V and 120V systems. These timers are used but have been refurbished, recalibrated, and tested to ensure "like new" performance. We provide a full 1-year warranty. timing range from 0.1 sec. to 99.9 sec. 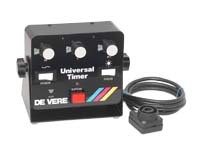 Note: The DeVere Universal Timer is designed specifically for use with De Vere enlargers and cannot be used with other brands of enlargers.